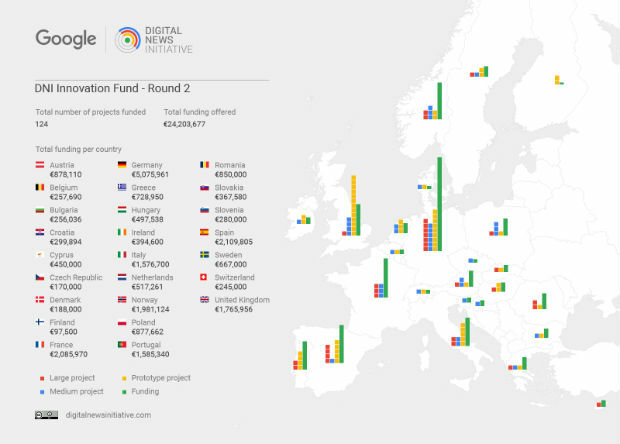 As part the second round of funding provided by the Digital News Initiative (DNI) in Europe, 124 projects developed by media organisations in 25 countries will receive €24 million (£20.6m) to innovate in the digital space, Google announced today. This brings the amount awarded by Google through the Innovation Fund to €51 million (£43.8m), a third of the total funding the technology company has pledged to European publishers for projects ranging from prototypes to medium and large scale initiatives. 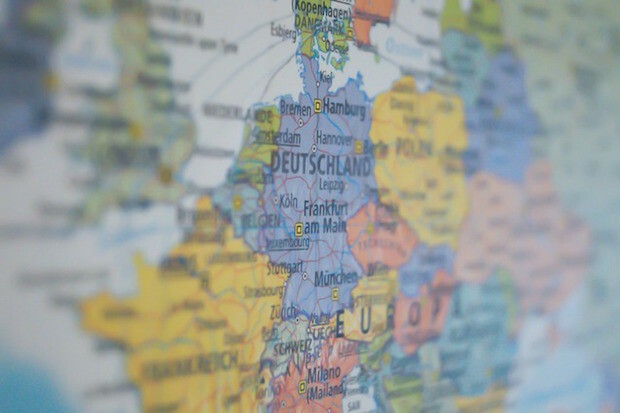 The countries that received the largest financial investments were Germany, Spain, France, Norway, United Kingdom and Portugal, with £4.35m, £1.80m, £1.78m, £1.70m, £1.51m and £1.35m respectively. The projects funded in the second round include The Vocal Bot, a digital assistant from Corriere della Sera in Italy, which aims to answers readers' news-related questions across devices, and Zombie, a tool from Swiss daily newspaper Le Temps that will use analytics data to resurface and republish evegreen articles when they relate to current news events. Among the successful applications from the UK are projects from Bellingcat, Johnston Press, The Financial Times, The Ferret and Full Fact, as well as Coventry University and the University of Central Lancashire (UCLan). Bellingcat will receive £81,205 to develop a platform that collects, verifies and analyses social media content from conflict areas, aimed at supporting journalists in their investigations, while Full Fact has been awarded £42,948 to build FACTS, the first fully-automated fact-checking tool. The second round of the DNI also introduced a new paramater for the programme: collaboration. Ludovic Blecher, head of the Digital News Initiative Innovation Fund at Google, outlined in a blog post published today, that 43 of the total number of projects and 15 of the 30 large projects funded promote a collaborative approach between publishers, academics, designers and entrepreneurs, both within individual countries and across borders. Both Coventry University and UCLan have put forward collaborative projects, working with news organisations such as the Coventry Telegraph and Trinity Mirror. The former will develop a platform that builds downloadable concepts of virtual reality games to enhance understanding of news stories, while the latter's project focuses on ambient design and the Internet of Things to create prototypes that can be placed in people's houses or public spaces to convey the news. Speaking to Journalism.co.uk in August, Madhav Chinnappa, director of strategic relations, news and publishers at Google, said the fund encourages publishers to be collaborative, because a lot of the challenges they are facing and trying to solve transcend individual newsrooms and borders. "We are interested in collaborative projects and seeing people work together, so it's worth thinking about your starting point and what exactly you are trying to solve," Chinnappa said. The full list of projects funded by the Digital News Initiative can be found here. This article has been updated to include a link to the blog post published by Ludovic Blecher.